Anthony Bourdain made an appearance at The Great GoogaMooga Festival in Brooklyn over the weekend, where he raised eyebrows by offering forth his opinion on cannibalism. 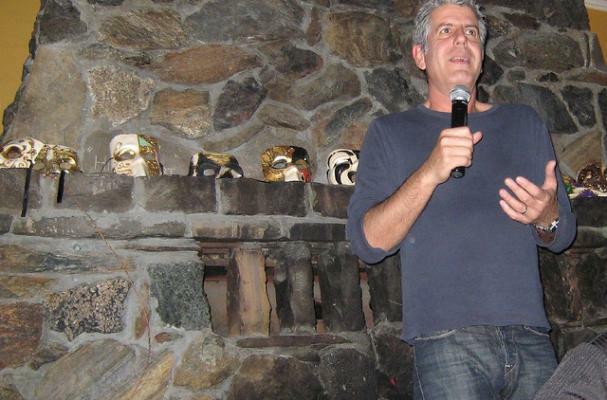 An audience member asked the chef-turned-TV-host if Bourdain would eat him if they were hypothetically trapped in a cave, to which he immediately replied, "F*ck yeah." He added that if they were trapped on a boat with a bunch of his chef friends and this guy wasn't pulling his weight, he would have no problem cooking him as a slow braise. Bourdain was asked straight up if he would eat a human. "Yes, yes, I f*cking would." It wouldn't be his first option though -- he'd eat a bag of Doritos first. Whether you love or loathe Anthony Bourdain, one thing's for sure: the man knows how to ruffle feathers.